People may want to recover the trimmed voice memos from iPhone. But the truth is, unless you had a backup of the original voice memo on iTunes or you had turned on iCloud, you can't really get the voice memo back in its original condition, even with the help of the best data recovery tools. Because the original voice memo has been overwritten completely. If on the other hand, you had backed up the original voice memo before trimming it, you probably be able to get it back. But before you panic and start to think about having to restore the device from backup, we are talking about being able to get into that backup file and extracting only that voice memo and nothing else. A powerful data recovery tool like iMyFone D-Back iPhone data recovery for Win or iPhone data recovery for Mac can help you do that. With it, you can easily select the iTunes or iCloud backup file that contains the voice memo and then use its preview function to select that particular voice memo for recovery, even iOS 12 was running on your device when you made the backup. Some of its highly useful features include the following. 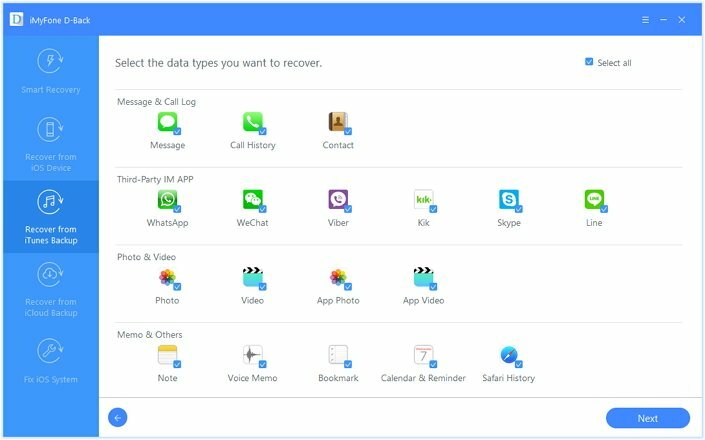 It is a powerful data recovery tool, able to recover 22+ types of data, including voice memos, photos, videos, messages, WhatsApp messages and more. It is very easy to use, you just need to select the backup file and the program will do the rest. The following is a simple step by step tutorial to help you get your voice memo back. We used an iTunes backup file but please note the process is much the same and just as easy if you want to extract from iCloud instead. Download and install the program to your computer and then follow these simple steps. Step 1: From the main window, select "Recover from iTunes Backup" and then click "Start" to begin. Select "Voice Memo" as the type of data to recover in the next window and then click "Next." Step 2: You should see all the iTunes Backup files on that computer displayed in the next window. Choose the one that contains the voice memo and click "Scan." Step 3: The program will immediately begin scanning the selected backup for all voice memos. 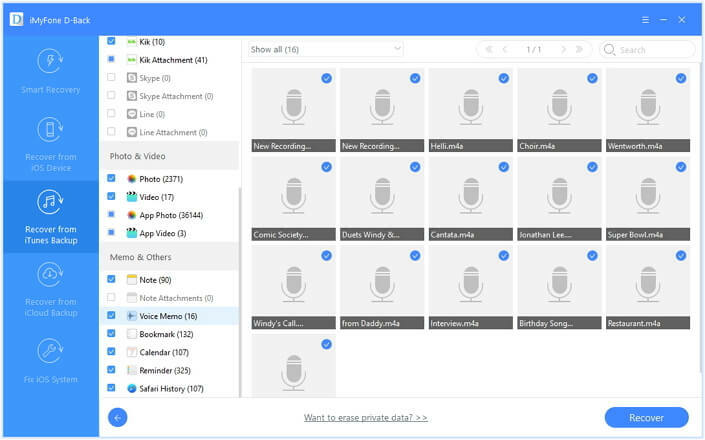 When it's done, all the available voice memos will be displayed on the results page. Select the one you want and click "Recover" to save it to your computer. 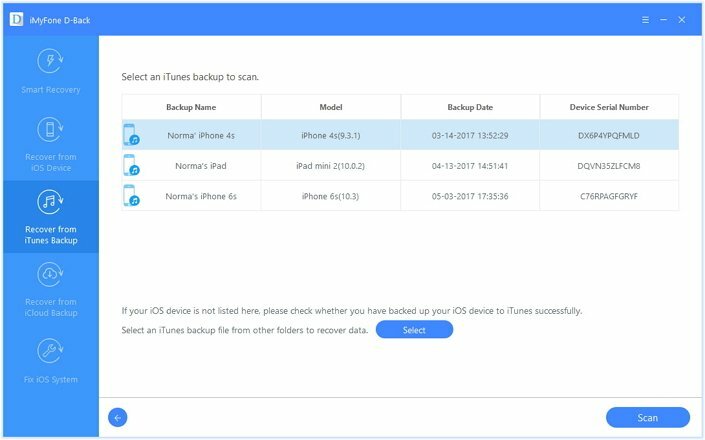 Download the free trial version of iMyFone D-Back iPhone data recovery for Win or iPhone data recovery for Mac to extract the voice memos from your iTunes or iCloud backup files.